Whether you have Borderline Personality Disorder (BPD) or simply consider yourself emotionally sensitive, the holidays can bring with them added challenges to be faced. 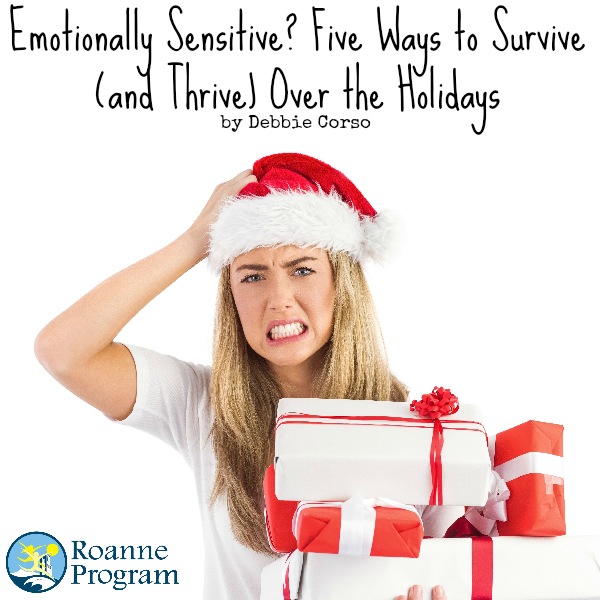 With a little bit of preparation and a lot of self-care, you can reduce your emotional vulnerability and increase your emotional resiliency during this sometimes trying time of year. Being emotionally sensitive often means that we are triggered by criticisms from potentially well-meaning loved ones who we haven’t seen in a while. For example, those age old questions, “Are you still single?” “You look good/healthy – did you put on a few pounds?” “When are you going to get married and give your parents some grandchildren?” “Why are you still living at home?” The trick is to EXPECT these questions. Cope ahead by thinking about how you would like to respond by setting boundaries, replying in a respectful way that allows you to feel dignified, and other ways you might cope, such as coming up with a funny response or a subject changer that puts the attention back on the person questioning you. Keep in mind that most people have good intentions and are just a bit nervous and out of touch with your life because they haven’t seen you. They may really be just innocently trying to make conversation and connect. Water off of a duck’s back. Do your best to let it go and move on with the festivities. 2.) Take care of yourself, including your mental and physical well-being. Take medications as prescribed. Eat regular meals. Get enough rest – not too much, not too little. Taking care of your physical health sets you up for better emotional resiliency. We all know that feeling depleted doesn’t do us any favors when we are dealing with emotional sensitivity. Get yourself prepped and primed to feel your best for these holidays. Oh, and avoid mood altering substances like drugs and alcohol. 3.) Give Yourself Permission to Take a Break. Pre-plan opportunities that will allow you to go for a short walk. Perhaps you can volunteer to walk the family pet, pick up last minute items for meals, etc. Go to another room to meditate, to the bathroom to splash water on your face or run soothing water over your hands. If you needs some space to recharge and re-center, take it, and you’ll come back much better equipped to cope. 4.) Ask for Support if You Need It. This works best if, in advance, you let a trusted love one know that you are doing your best to cope effectively and may need some support if things become too overwhelming or anxiety provoking. Let the person know how this typically manifests for you, i.e. anxiety/panic attacks, a tendency to withdraw, urges to drink or use, and let them know how they can best support you in being skillful. If you find yourself in need of this support, SEEK IT OUT, and rebuild your strength by skillfully getting back on course. If things get really out of hand and you feel like you may be at risk for harming yourself or someone else, seek immediate local psychiatric/professional help to get the support you need to stay safe. May your holidays be filled with much joy, despite the difficulties that can also arise. Remind yourself to be in the present moment, as mindfully as possible, enjoying as much as you can. Remind yourself during the difficult moments that these shall pass. The holidays won’t last forever. The normal schedule and routine you are used to are coming back, just around the corner. You have the ability and strength to make it through, one moment at a time, one breath at a time. You got this! For information on OPI residential and intensive outpatient programs, call us at 866-661-3982 or click HERE to submit an online form. We’ll be in touch promptly.